Can a film have simultaneously a sad and happy ending? One Flew Over the Cuckoo's Nest is both a comedy and drama, with its story of individualism versus rigid conformity still relevant even if the film itself is a bit dated. In Oregon a mental institution is run by Nurse Mildred Ratched (Louise Fletcher), an iron hand in a velvet glove. The institute is efficient, calm, orderly but soulless. 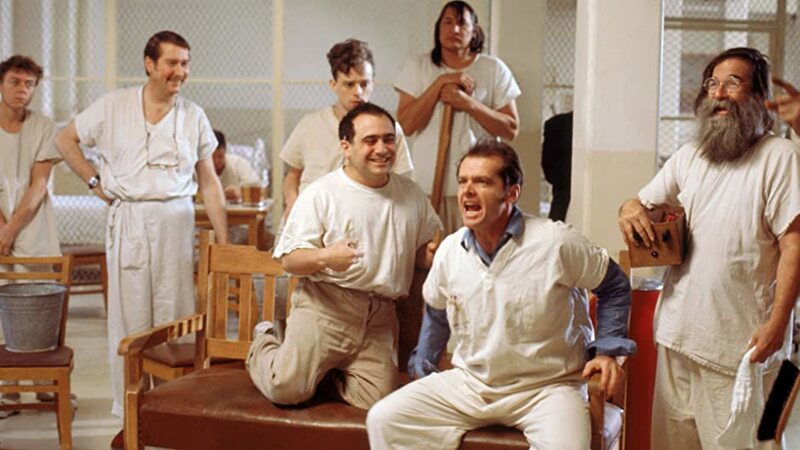 Enter Randall P. McMurphy (Jack Nicholson), a habitual criminal undergoing evaluation for possible mental illness. McMurphy is nowhere near insane: he just does as he pleases. He is delighted to be at the 'funny farm', at least initially. He has greater freedoms than in prison and more importantly does not have to work. Unfortunately for McMurphy, he finds that Nurse Ratched does not suffer whom she considers fools gladly. Using whatever powers she has, Ratched is displeased by how McMurphy disrupts her orderly ward and the influence he has over the various troubled men. McMurphy wants things his way all the time, but he cannot get his way all the time. It soon becomes a battle of wills between them. Caught in their private power struggle are the various patients, from the stuttering innocent Billy Bibbit (Brad Dourif) to the man-child Cheswick (Sydney Lassick) and the pompous Harding (William Redfield). Their various group therapy sessions are where their cold war battles take place, with McMurphy's disruptions and Ratched's petty power grabs being a to-and-fro series. Also observing this is Chief (Will Sampson), a giant of a man whose nickname comes from his Native American heritage. He is believed to be a deaf-mute when in reality, over the course of the film, we see that is able to hear, talk and think quite clearly. McMurphy is doubly horrified both by the fact that he is one of the few who finds himself permanently committed and that most of the patients are there voluntarily and can leave anytime they want. After a fight McMurphy is subjected to shock therapy, but still his defiance holds. It is only after a raucous party McMurphy throws is discovered that things come to a brutal and tragic ending for Billy, McMurphy, and up to a point Ratched, but not without the reward to Chief (real name Bromden), who is finally free. 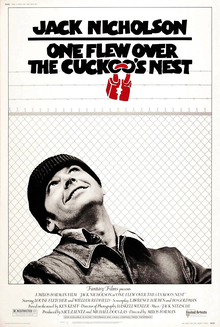 One Flew Over the Cuckoo's Nest should have as its theme a line used by the various doctors to describe McMurphy. "He's not crazy but he's dangerous". That is the key to seeing the message behind the surface story: that the rebellious McMurphy is a danger to the order of things, coldly and efficiently run at the institution. The power struggle between Ratched and McMurphy is I figure symbolic of that between authority and individualism, between having control over places and people and being able to do as you wish. Director Milos Forman and screenwriters Lawrence Hauben & Bo Goldman do extremely well in being clear about the story working on two levels without being blatant. Take Nurse Ratched for example. With her cold demeanor and hairstyle that makes her look as if she has horns we see in her the tyranny of both conformity and stability. She herself is not overtly evil but far worse. She is indifferent, unaware or uninterested that stability leads to staleness. Her rigidity on all matters is so great that when positive aspects to McMurphy's involvement do take place she simply does not care. She does not care that the formerly mute and disengaged Chief participated in a vote. She certainly does not care or even notice that Billy stopped stuttering, him if not cured at least much better off. For her, Billy defied her and her order, so she uses the weapons at her disposal to drive Billy into total submission: his fear of his mother. It is at this point where the audience reacts with total hatred towards Nurse Ratched and where she becomes truly evil. We know she is responsible for Billy's horrifying end to where McMurphy's violent reaction seems almost justified and worthy of praise. Louise Fletcher's performance is absolutely brilliant: rarely raising her voice, she displays Ratched's malevolence in her demeanor and the coldness of her eyes. She is matched by Nicholson, for whom McMurphy seems tailor-made as our rascal rebel. We see McMurphy's evolution from lackadaisical schemer to one who has a genuine, if perhaps misguided heart. It's in little moments, such as when he hesitates to leave at the end to know what happened to Billy, and his genuine rage when he sees the end of that poor young man. Dourif too has an innocence to his Billy, a young man who would have benefited less from his therapy than by positive reinforcement. The film also has many actors who would become big names such as Danny DeVito and Christopher Lloyd who also did fine work. Perhaps the fishing expedition now seems a bit curious, not just in why it's taking place but in how there is no retribution to such a flagrant act of disobedience. As allegory and as a straightforward narrative One Flew Over the Cuckoo's Nest works extremely well. Perhaps a bit dated in style, that minor issue is lessened by its strong performances and story. It is never madness to wish to be free.